Ana Prada will be teaching a fabric intensive and Vayu teacher pre-training and training in the IACC in April/May. 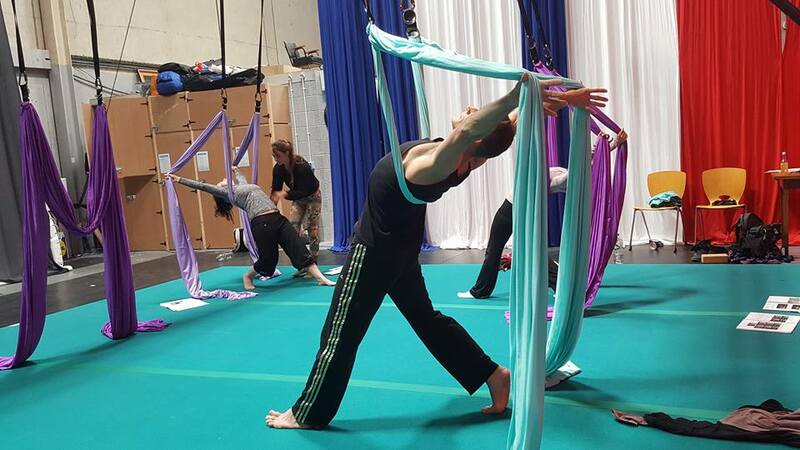 Vayu Aerial Yoga is a practice that has been developed to create space mentally and physically, by opening up the body through various postures using our custom designed yoga swing. The Vayu Swing is a support system and tool used to facilitate and understand alignment while creating space within the body. Through specific articulation of movement we incorporate strength and the lengthening of the muscles isometrically to create core strength and balance. The Vayu practice takes the body to a much deeper level. Using the support of the swing we are able to challenge the body moving through various postures, as well as allowing the nervous system to relax, encouraging a letting go into complete surrender. Inverting the body while suspended in the air not only provides many physical benefits such as spinal decompression, it also expands the mind by creating confidence, overcoming fear and allowing a change in the standard physical perception. We are able to explore this found freedom and awaken our inner child bringing a playful light energy to our hearts. It is truly the experience of a floating meditation. The VAYU course will be a pre-training with the purpose that people will get a kinesthetic experience as well as get familiar with the method. 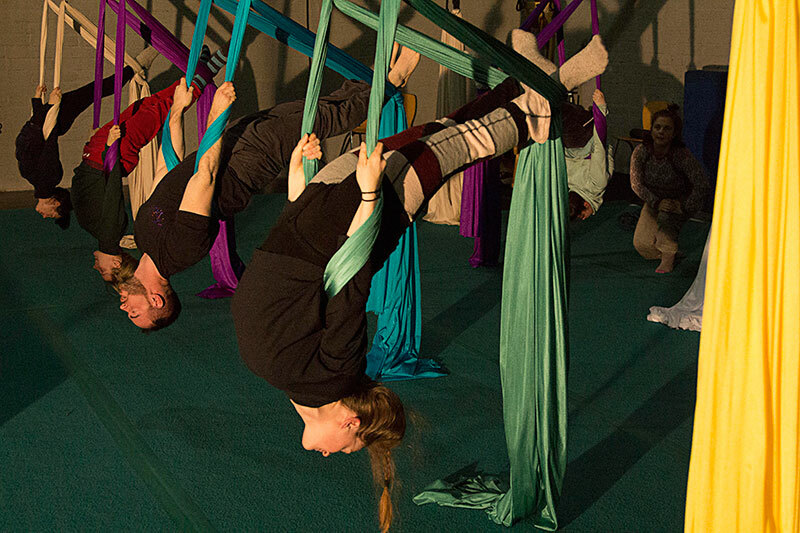 The main idea of VAYU Aerial Yoga, it’s to help people connect on a deep level, yet in a fluid and organic way with the pelvis, the center. Creating space and letting go, shedding the layers of tension to become aware of sensations and of our body. Also get to the central nervous system. Using breath, we will use the support of the fabric as a tool, to get to the connective tissue allowing it to free the fascia and let go of adhesions, so when we start working more muscularly the body will be open structurally and energetically. In Ana Prada’s work, there’s a confluence of techniques, she has study, Yoga (since 1998) She’s a GYROKINESIS®, GYROTONIC® certified trainer and Pre-trainer, Dancer, Aerial Dancer and Craneo Sacral therapy. All of this movement methods, as well as her experience in the Air, as a Performer and Aerial dance teacher, for the last 18 years and her own movement and somatic research influence and are part of the work. This year we have change the teacher training format in an effort to keep the quality and depth of the VAYU system. The Pre-training will be a 3-day course, 5 hours a day. For those to wish to know the method and deepen their practice as well as understand the principles and essence of VAYU. It will be a prerequisite for the teacher training. In the VAYU teacher training we will keep working in the same principles as in the Pre-training, breath, connection and working the body as we move more into standing connecting sequences, mid level, backbends and inversions. Always with the same care for the body, respecting and understanding alignment, breath , allowing the body to open and connect. Ana Prada was born and raised in Colombia. She’s an aerial dancer and yoga practitioner since 1998. She studied contemporary dance in New York City, where she started to explore aerial apparatuses like dance trapeze and rope. She then moved to Montreal where she specialized in aerial silks and hoop. Ana has worked with companies and shows like La Esquina Desplazada, Triknia dance company, Colombia, Cirque du Soleil, “El despertar de la Serpiente” for the Expo 2008 in Spain, the show ‘Ulalena (Maui, Hawaii) working as an acrobat, dancer, and aerial coach. She also has developed her own solo work, presented in different festivals and venues. She developed the Vayu Aerial Yoga system and teaches workshops and teacher training all around the world. She’s a certified yoga, GYROKINESIS® and GYROTONIC® instructor, and Pre-trainer and has apply all of this knowledge to the Aerial Dance technique creating a project called The sustainable body project. She has shared her talents performing and teaching at many different studios in Montreal, Costa Rica, Brazil and also at several international workshops and festivals like ADF in Boulder, Colorado, EADF in UK (European Aerial Dance Festival) , Les Rencontres de Danse Aérienne – France, Air to Floor Aerial Dance festival in Santa Barbara and workshops in places such as Hawaii, British Virgin Islands, Greece, Miami, Brazil, Costa Rica and Colombia. In 2017 Ana was delighted to received the Roser Grant –Artist in Residence from the dance department at the University of Colorado in Boulder, teaching and choreographing with her Aerial Approach to the Grad students of the program. In her work, she is always interested in finding a deeper balance and a real organic connection: “aerial roots” to be grounded wherever she goes. Now she lives in Montezuma, Costa Rica where she continues her research in Aerial Movement, practices Craneo sacral theraphy and teaches intensive workshops, teacher trainings and master classes. For any questions, please contact us. To pay a deposit or the full amount, please see below. To book the Fabric Intensive, look under “special events” on the booking page. Vayu Pre-training with Ana Prada. April 27th - 29th. Vayu Teacher Training with with Ana Prada. You must have completed pre-training at some point.